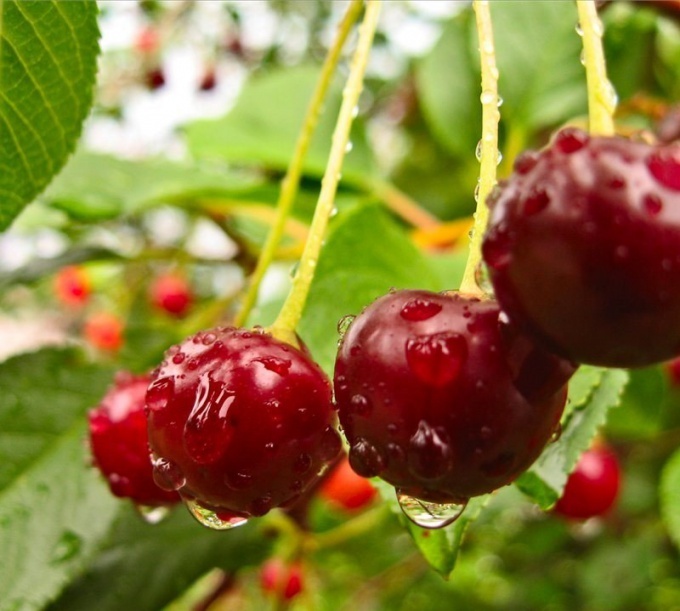 If on ripe cherries or cherry appeared pits, or pits, berries darkened and started to fall, the plant is subjected to attack of the cherry fly. Luckily, this trouble can be get rid of. Start to deal with this little pest in early spring, when the snow melts and the soil dries up. The fact that the cocoons (puparia) overwinter in the soil at a depth of 5-7 cm, so to get rid of the pest, it is recommended to dig the soil and manually select dolls (to notice them is simple: they are bright yellow in color, reach a length of 4-5 mm), as well as to make a soil insecticide. Particularly effective in this case, the "thunderbolt", "the Bear-Tox", "Mruvka-Bytes" and "Prestige", they are dissolved in water (proportions stated in the instructions) and sprayed with a solution of the ground around the affected plants. When cherries or cherry Bud, followed closely by summer flies emerging from winter in the soil.. To do this, construct a cage-trap made of boards (length – 1 m, width – 17-20 cm) down a bottomless box, one side of which the folded cover in 2-3 layers of gauze. Next, set the tank near a tree which was attacked by the cherry fly (the open side of the cage should be located near the ground). After that sprayed trees of medium and late varieties of pesticides: "Pyrethrum", "Anabasine sulfate", "Kremneftoristyj sodium", "Paris green" or soapy emulsion. But we should remember that the first spraying is carried out only when the ground is already heated, and the air temperature is -18 ºc. Re-spraying is carried out after 13-15 days after the first treatment, but not later than 2 weeks prior to harvest. For treatment of trees you can use the following insecticides: "Karate", "Zipper", "Spark", etc. it is Important to alternate the used drugs (this will prevent the habituation of the pest to commonly used insecticides). Trees of early varieties to be sprayed with pesticides is impossible. After harvest you should clean all the ground, for example, you can bury it a foot deep. Such event will prevent the appearance of new larvae in the soil and pupation. Along with cherry flies is recommended to deal with cherry aphids, because of her sweet secretions to feed on the pest. Against aphids, you can use a decoction of wormwood or soap solution. So, the latter forms an airtight film, which suffocates aphids. Instead of toxic chemicals in the fight with this brown fly, you can use natural remedies. For example, take a pine branch, filled with water (3-4 liters), bring to the boil and cook on low heat for 5-7 minutes. The broth is filtered and cooled. This aromatic "cocktails" sprayed trees and the soil around them. In combating the pest is an effective decoction of onion peel, garlic and tobacco. In addition, this pest is an unpleasant smell of tobacco. Therefore, we take 1 kg of fresh or 370-400 g dry tobacco, pour 10 liters of boiling water and insist for 22-24 hours. Then, the infusion is boiled for an hour, filtered and ostuzhayut. Ready means diluted with water (ratio 1:2) and sprayed them with the trees and the soil around.